Icons constitute a lingua franca in our everyday interaction, constituting ubiquitous tools for an effective information between cultures and platforms, and they might be a simple resource for multi–cultural communication in critical contexts. Guemil is an icon initiative oriented to represent risk and emergency situations. Packed in an open source digital font, available for download and use in multiple formats, it makes available a simple visual tool to facilitate communication in multiple stages and platforms: before > > during > > after an event, as a visual information continuum for communities along their emergency experience. Icons are useful resources for communication in a global reach but also to explore knowledge performance from everyday interaction. As an applied research project, Guemil icons have been incorporated an international testing process, collecting responses and revealing interesting insights about their meaning and differences from users in 27 countries. A visualization of preliminary results from meaning tests are available at: www.test.guemil.info. A refined version of icons –v10– have been released in mid-2018, after the first testing process. More data is currently being analyzed for further publishing. Guemil is also an experimental initiative revealing the power of visual communication in disruptive scenarios: Since 2016, a group of students and colleagues have enthusiastically joined the project, contributing to give shape to workshops for emergency, tests forms, data visualizations, web design and even developing emojis, following open source projects such as Openmoji. in 2017, Guemil was awarded as Shortlist in IIIDawards in Emergency category. In Mapuche iconography, the Guemil is a symbol for writing system. It represents domain of science and knowledge as well as the manufacture and the art of transformation. 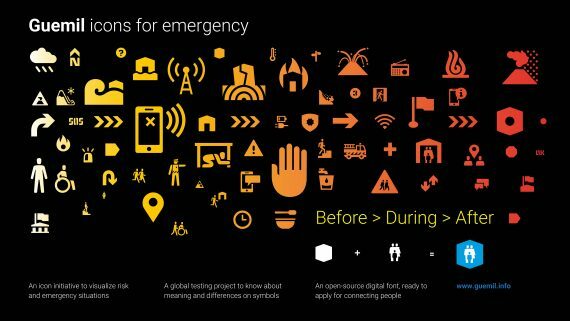 Guemil Icons for Emergency is a non-profit design project conducted by Rodrigo Ramírez, Information Designer, Faculty Member from UC School of Design and researcher from CIGIDEN, Santiago de Chile.